In December 2018 compared with December 2017 the calendar adjusted retail sales index increased by 0.8% in the euro area and by 1.2% in the EU28. 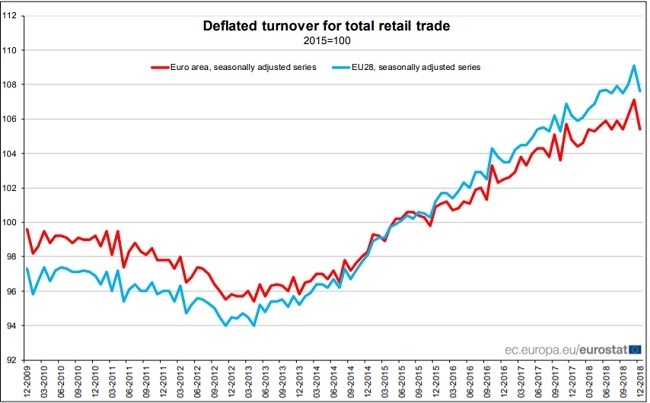 The average retail trade for the year 2018, compared with 2017, rose by 1.4% in the euro area and by 2.0% in EU28. In the euro area in December 2018, compared with November 2018, the volume of retail trade fell by 2.7% for nonfood products and by 0.3% for food, drinks and tobacco, while it increased by 0.5% for automotive fuel. In the EU28, the retail trade volume fell by 2.6% non-food products and by 0.4% for foods, drinks and tobacco, while it increased by 0.7% for automotive fuel. Among Member States for which data are available, the largest decreases in the total retail trade volume were observed in Germany (-4.3%), Sweden (-2.5%) and Estonia (-2.0%). Increases were registered in Austria (+0.7), Portugal (+0.6%) and Ireland (+0.5%). In the euro area in December 2018, compared with December 2017, the volume of retail trade increased by 2.5% for automotive fuels, by 0.7% for food, drinks and tobacco and by 0.5% for non-food products. In the EU28, the retail trade volume increased by 3.3% for automotive fuel, by 1.2% for non-food products, and by 0.6% for food, drinks and tobacco.